Harlem native and hip-hop artist Tommy Danger is one of the first independent artists in Harlem to have his music video “Now & Later With Me” on Sprint and O2 Network. Ultrashort Media, one of the most serious and accomplished mobile media shops out of LA, recently launched a music entertainment channel streaming music videos to mobile phones in the UK on the O2 Network, and in the U.S. on the Sprint Network. This means that they are in the enviable position of actually delivering on getting your music videos played in the hands of young listeners across the world. Tommy Danger The Now & Laterman is not only an underground hip-hop and rap artist. 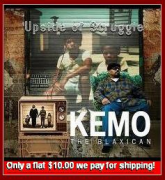 He’s a Hip Hop Artist, first and foremost, and has distributed over 10,000 CD’s Volumes 1-8 independently. Tommy Danger is also a television host for Danger Vision (Hip-Hop video show with discussions on everyday issues) and has been on air for two years, with 77 episodes and over 500,000 viewers. He’s written articles for Connex Magazine and has featured in a commercial for Gino Green Global Clothing. Tommy Danger has three music videos on 15 T.V shows, 10 internet sites, and BET Uncut.